February is love month due to Valentine's Day. It is when you'll mostly see many lavishly colorful objects shaped like a heart and decorated to be romantic enough to attract the attention. Well, it could also have been during the Ber months starting September due to the holiday season, but February is also a special month for me because this is when we gained freedom from the hand of a dictator during this month several years ago. Aside from this, it is the only month where there are only 28 days (and 29 days during leap year). In other words, it is a specially unique month among other months. This also marks the beginning of family bonding, overflowing patience and generosity with one another especially among our family members because it was on February 11 and 12, when my husband and I celebrated Valentine’s Day in advance in one of the many prestigious suite rooms of Torre Venezia Suites - a hotel located in one of the busiest commercial places of Quezon City where you could find lots of commercial establishments that are ideal venues for all kinds of special events and celebrations. Actually, we always try to find time to bond with our kids, especially now that they are already teenagers. Our eldest is 18, second is 17, and the youngest is 13. It is during this stage that children usually don’t like to be seen with their parents anymore simply because of peer acceptance when they want to appear mature enough to be independent and not so endearing or "malambing" towards their parents. Now that they are older, there's no room for excessive display of affection even in the privacy of our homes. I believe the school doesn't provide the kind of relationship training they are most likely to enter when they finish their studies. I should know since most of the useful knowledge I needed in life I learned only from outside school. The school is not fast enough to evolve together with the kids making most of the studies irrelevant and obsolete by the time they finish college. Children nowadays don’t want to be bullied as mommy’s or daddy's girl/boy. This is the reason why we always make sure to have quality time with our kids. As expected, our pre-Valentine’s Day celebration at Torre Venezia Suites did not include the kids. Even after our persistent request for them to join us in our staycation, they insisted that it is for us to enjoy each other’s company. We know it is only an excuse for them to stay at home so they could enjoy their gadgets and the Internet, but we went along since we believe we needed the break to have some quality time for ourselves - just the two of us. We arrived in the hotel at around 10:30 am on a Saturday morning because of a special request to join a food tasting event at their restaurant. However, we were only called down to join them for lunch at around 12:30. Imagine how hungry we were already since we only took a light breakfast thinking the early call time for the food tasting would require us to eat early lunch as well. We should have known to expect delays, but two hours of waiting was a bit too much. It was good that we insisted to be checked in to our room first so we wouldn't have to wait in the hotel lobby. Though they did told us we were going to be escorted to the room earlier, the staff seems to have some sort of communication problem that the check-in never happened until we reminded the lobby staff. Our hotel contact personally escorted us to the room instead. We had a buffet lunch in the hotel’s Rocca Ristorante restaurant which is located at the 7th floor of the hotel. It was a great thing that the dishes were good, or was it because we were so hungry that everything we tasted was good enough? Food review? What can we say about the meals we had for lunch? Well, we could have reviewed it more intimately but our hunger got the best of us since we had to rush our dining experience. Still, the food were above satisfactory if taste was the only criteria to be considered. Even though I am still biased to meals that are plated and creatively laid out by chefs or restaurateurs who know how to make a meal appetizing, the buffet composed of beef, chicken, pork and fish selections was above average appealing. The dessert could do better, but I really didn't expect to see the same lavish treats as experienced from hotels above their category. What they have is satisfying enough. 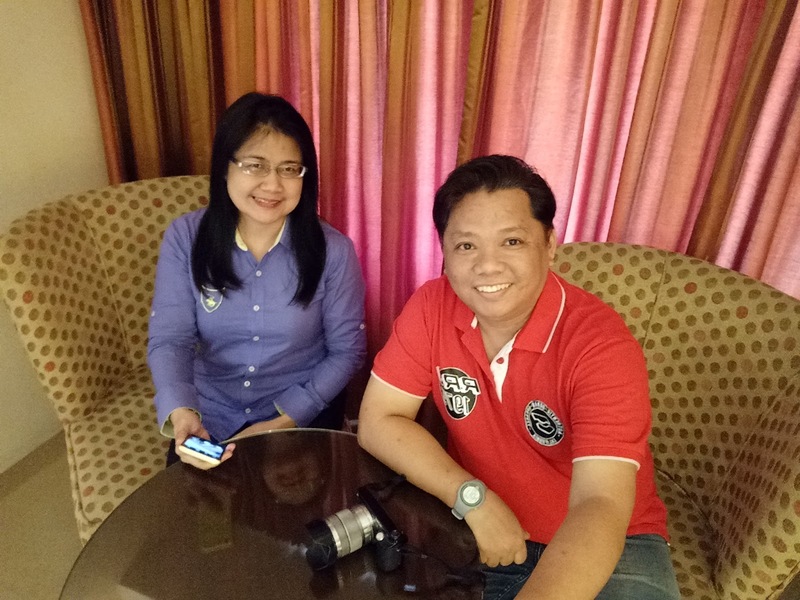 After our lunch, we were toured around the hotel by the hotel's pretty Marketing and Promotions Officer, Ms. Kathy Capulong, the our hotel contact and the one who invited us to try their staycation. We were shown a few types of rooms and another that was of two-floors. However, Torre Venezia Suites has many types of rooms like Napoli (Standard Suite), Torino (De Luxe Suite), Genova (Junior Suite), Roma (Panoramic Suite), Verona (Classic Suite), Milano (Executive Suite), and Venezia (Premier Suite). Since that's a lot of photos, if you want to see how they look like, please check our official Facebook fan page albums for photos instead. Below are images from our room. 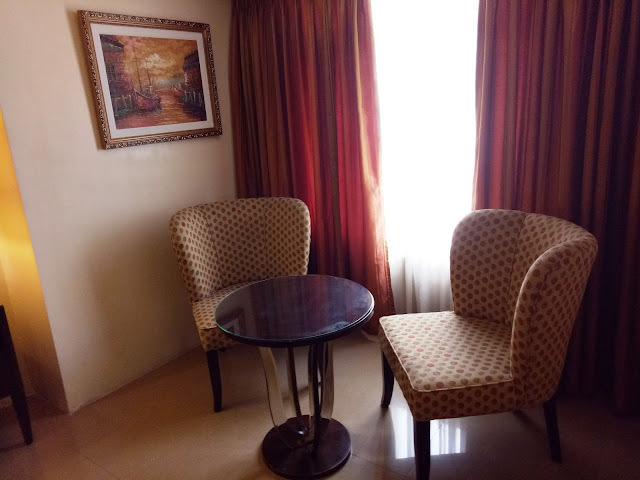 Our room, the Genova suite, is spacious and comfy for a couple like us. It is fully equipped with appliances and other necessities like a refrigerator, TV, bathroom, LED TV, of course the air-conditioning, and everything else that would make our weekend stay more comfortable. We've forgotten about our bad experience about lunch at Rocca Ristorante when dinner time came as we got to order whatever we want at a certain budget. Of course, since it was an Italian-themed hotel, we decided to order something more fitting to the theme - pizza and pasta! Though I was a bit confused about their all-meat pizza having veggies. We also ordered fresh fruit drinks to make dinner more perfect, and healthy since we are both health advocates who try to stay away from sodas and artificially-flavored drinks. The restaurant's Valentine's Day decorations made the night more intimately special. 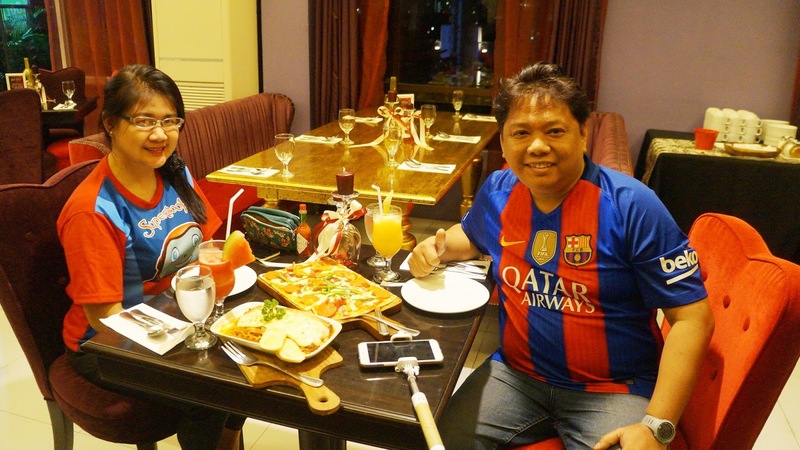 To make it a bit different, we wore our colorful shirts with my husband wearing the FC Barcelona jersey, while I was wearing the Superbook shirt featuring Gizmo. We were calling ourselves Messi and Gizmo all throughout our social media posts while we wore the shirts. However, the night was made absolutely more memorable come time to return to our rooms. For us, it is very rare that we get the opportunity to be together alone by ourselves. You can imagine our excitement to finally share time together more intimately as a couple. The room was too cold for the two us so we had to hug each other as tight as possible to generate heat for our bodies. Nah! That was just an excuse to make love-making happen more than once this time around. Lol! The said hotel also has a swimming pool, gym and located right opposite the church of St Paul the Apostle which made it convenient for us to attend a Sunday mass. We heard mass in the mentioned church after taking our buffet breakfast at the same restaurant of the hotel. The buffet breakfast offered pancakes, eggs, barbecues, hotdogs, champorado, fruits, and not to forget the coffee. Though Wi-Fi is quite fast in the hotel, we still managed to find time to talk about everything as regards to our plans for our children and their future. We know that we are no longer getting any younger so we need to shape up and help our children in deciding what career they will embark after Senior High School. Our only disappointment with our Torre Venezia Suites pre-Valentine's Day staycation is that we were expecting a more romantic atmosphere sine the invitation was for their pre-Valentine's Day preparation. The e-mail also had an attached Valentine's Day season promo from February 1 to 15 which included a buffet dinner and complimentary massage for two so we were expecting something special. But on a positive note, a bit mushy as it may sound, but it was through this hotel staycation at Torre Venezia Suites, that we were able to renew or strengthen our relationship again, not only as husband and wife, but also as best friends with special privileges. A couple that will remain truly in love forever...and that's not an exaggeration but a passionate declaration of our undying love for each other. Overall, the staycation experience was rejuvenating and enlightening as this was the very first time we went out to celebrate the season of the hearts. It may not be at exactly the same day as Valentine's Day of February 14, but it was great to know we were ahead of everyone else to exchange our dearest and most meaningful affection towards each other 50 shades darker than any other red heart-shaped Valentine's Day decor out there. Just as how our staycation was not as perfect as we wanted it, we would like to thank you Torre Venezia Suites for showing us that it is in the imperfection, just as how we are similarly, that we see how lucky of us to have each other to make up for what we each lack. After all, there really is no perfect person but only a perfect couple that's willing to accept each other's shortcomings, and continue to love each other regardless.